As my husband is snoring away the night sleeping by me and me, a night owl with my earphone hooked on to my ears, catching the peppy Hindi numbers being played in the radio station, I recall my bachelor days in my parents' home when I used to retire to bed every night with a pair of headphones plugged into ears, listening to the nocturnal programs aired on radio dropping off eventually, still wired. Hardly a gap of few years, and so many things have changed. I got married; my most beloved childhood companion breathed its last, my maternal uncle passed away and so many veritable other things have taken place, one after another. I read somewhere "Change is the only thing that is constant." But we all pass through an age when we think that we won’t grow old, others will but we won't. However, time ticks by making us realize in due course as we step into the shoes of our parents and as the older generation dwindles into eternity in contrast with the younger generation growing into adulthood, we open our eyes as our parents did, years ago to the change. It's shocking how quickly time flies. 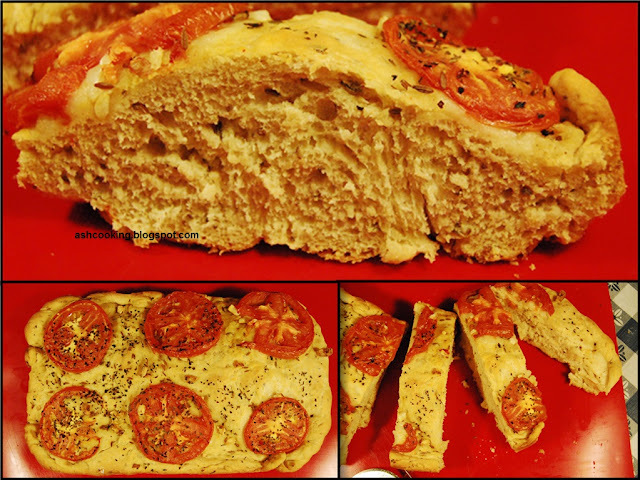 Anyway, deviating from the serious topic above let me share a recipe of Focaccia Bread that I recently baked. 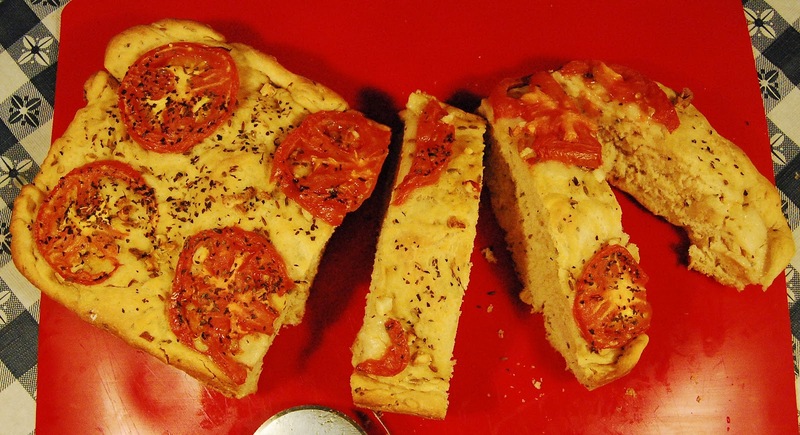 Focaccia is Italian flat bread that comes close to pizza in texture, though not the same. Topped with choice herbs and generous amount of olive oil, it is basically yeast bread processed through a laborious effort. I maintain yeast bread involves a convoluted procedure, really time taking and requiring patience in following through on the steps. So unless you are passionate about baking and willing to undertake the endeavors to taste the fruit of your labour, don’t try it. 2) Meanwhile, put together flour, sugar, salt, ajwain, fennel seeds and paprika. Make a well in between using your finger and stream in the olive oil. Add the yeast infused water and some more warm water (1/3 rd cup) to work a soft dough. The dough would be little sticky to begin with, so dust your hands with flour repeatedly while kneading and knead for about 10-15 minutes until the dough becomes supple and easily malleable. 4) When the dough becomes double in size, deflate it by punching your fist in it. It will release the carbon-di-oxide that the yeast reacting with sugar has created. It will thus become pliable enough to be molded into any shape. 5) On a lightly floured surface, work the dough into the desired shape by stretching it on all sides. 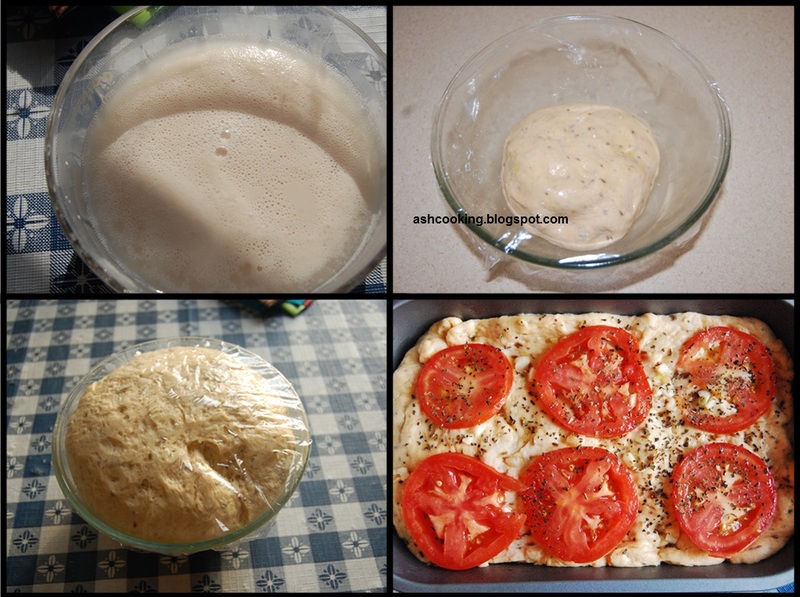 6) Place the dough in a lightly greased bread pan. Brush the surface with olive oil. Sprinkle cumin seeds. 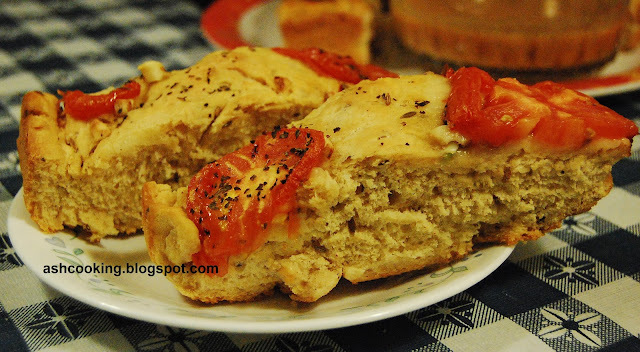 Pitch the tomato slices, evenly scattering the minced garlic and dried basil leaves across the top of the bread. Cover the pan with a plastic wrap loosely and let the dough rise the second time for 30 minutes or so until double in size. 7) In the meantime, preheat the oven to 400 F/204 C.
8) When the bread swells to twice its size, drizzle little olive oil around the surface and bake for 30 minutes till the top is browned. 9) Serve warm with a bowl of soup.